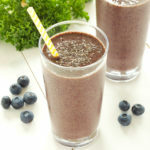 This Blueberry Kale Power Smoothie is the perfect healthy breakfast or snack that's packed with nutrition! Make it dairy-free and vegan! Add the blueberries, kale, yogurt, banana and chia seeds to a high-powered blender. Add the water (or other liquid) and blend on high speed until smooth and creamy. Pour into glasses or a smoothie cup, garnish with some extra chia seeds if desired, and enjoy!